Yoder is located Southeast of Colorado Springs. It is sparsely populated, about 5 people per square mile. Yoder is mostly rural country. 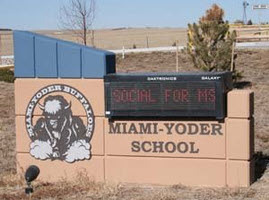 The school district that services Yoder is Miami Yoder. The schools in this district are Edison Academy and Ellicott Elementary. Some of the parks in Yoder are: The Paint Mines Interpretive park which is full of colorful sand stone pillars, Homestead Ranch park, and Cottonwood Creek park.